“temporal.Divergence” is an ambient-electronic sci-fi inspired “mindscape” – ambient pads and notes wash across the soundscape, computers and machines go about their covert operations, and occasional beats, drums and light distortion increase the tension as the listener is propelled through time, adrift in open space, or on some massive craft as it rips through invisible portals on a journey to past or future. 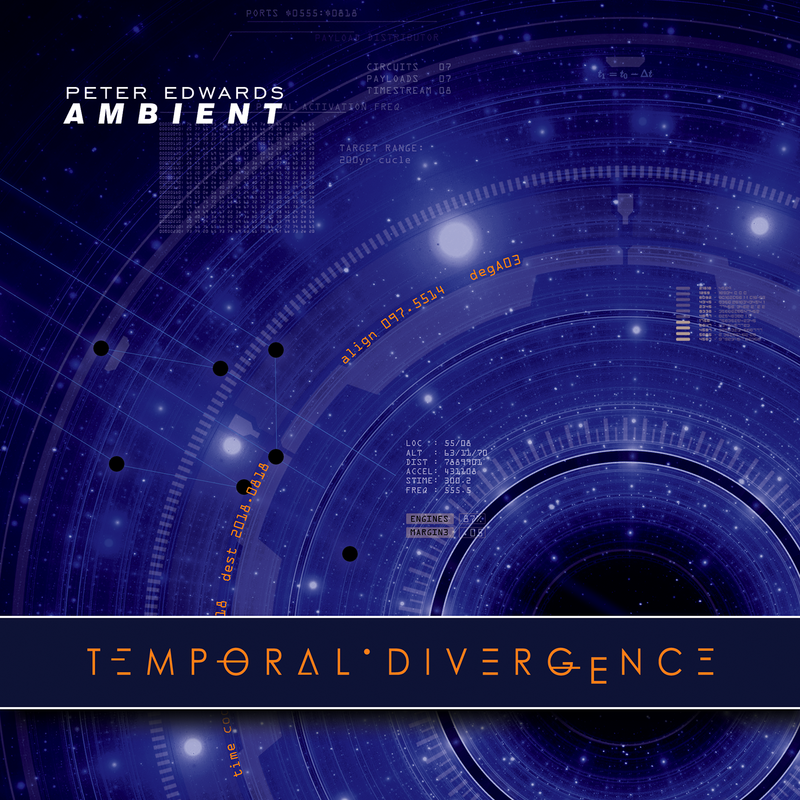 “temporal.Divergence” is the next release in the dark ambient pentalogy from sound designer Peter Edwards Ambient. Building on his previous works, Peter weaves a deeper web of mysterious, brooding ambient that draws the listener into its evolving story of time travel and the future of human evolution. The album begins with a warning that manipulating time and space has unintended consequences for humanity. The identity of this voice is unknown, but seems to be someone we’ve met previously on the 2017 soundscape release “binary.Abstractions”. As always, field recordings are used as the base of Peter’s creation. He enjoys twisting and manipulating everyday sounds to create a feeling of wide open, empty and potentially dangerous alien spaces through which the listener can wander and get lost… or worse. “temporal.Divergence” has an almost sci-fi quality to it – ambient pads and notes wash across the soundscape, computers and machines go about their covert operations, and occasional beats, drums and light distortion increase the tension as the listener is propelled through time, adrift in open space, or on some massive craft as it rips through invisible portals on a journey to past or future. One of the secret bonus tracks available on the main website (we’ll let you figure out how to get to it) actually sounds like it could be the theme for a sci-fi TV series, and will supposedly be featured on next year’s release in final form. “temporal.Divergence” is quite familiar and yet also a nice evolutionary progression from Peter’s previous albums, utilizing a wider variety of instrumentation and what seems like deeper sound design. If you’re a fan of experimental ambient music, science fiction, and immersive sound experiences, be sure to give this one a try! fringe theory suggests alternate forms of temporal manipulation, most involving the required harnessing of darkmatter, a technique mastered early in the 23rd century. 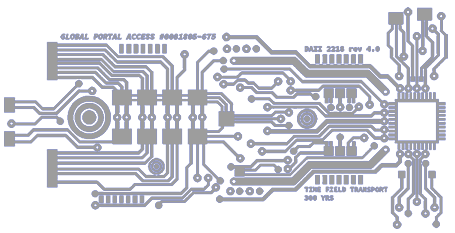 electronic implants allow us to control the gates through which we travel. jumping is impossible without these biohacks, as many outliers have unwittingly discovered. Solutions for the 23rd century and beyond. automating temporal manipulation has promising effects for the future: higher accuracy and the ability to adjust on-the-fly for unforeseen variables, minimal downtime and increased success rates. the control systems we have in place will insure against rogue AI activity. the Core is learning at an exponential rate and will soon be able to oversee all aspects of the temporal manipulation project. “temporal.Divergence” is the next release in the dark ambient pentalogy which began in 2015 with suspended.Lucidity. This release builds on my previous works, and I’ve attempted to broaden the instrumental palette, weaving a deeper web of mysterious, brooding ambient that will hopefully draw the listener into its evolving story of time travel and the future of human evolution. Ever since I was a young man in my old timeline, I’ve been fascinated by time travel and the implications it has for individuals and society as a whole. My discoveries, however, have changed my opinion of its worth. There are factions that would lead you to believe that it’s safe, that it has only the highest potential for creating a truly glorious utopia on earth. These claims are fabricated to conceal the real truths here: we are being guided to embrace the new jump-enabled bio-tech for reasons I’ve discovered are more ominous and far-reaching than we’ve been led to believe. Listen closely. Keep your eyes and EARS open. The reality uncovered in binary.Abstractions has come to pass, but not in THIS timeline. There’s still a chance to avoid the enslavement of humanity. The following core download packages will provide further data for travellers who have already experienced Temporal Divergence and cleared access through the Dark Ambient Infiltration Initiative. Access code required. BONUS PACK v1.0 2018-08-31 : Access key required. BONUS PACK v2.0 2018-11-11 : Access key required.